Tobacco is unique compared to almost all other agricultural commodities as some processing of the raw product occurs on farm. This processing is in the form of curing. Curing refers to changes undergone by harvested fresh tobacco leaves under regulated conditions of temperature and humidity. The basic purpose in curing is to produce a stable product of suitable physical and chemical composition for use in cigarette manufacture. 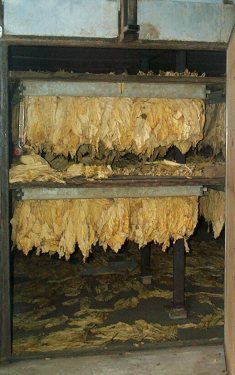 Up until the mid 1970s, tobacco leaf was cured in barn-like structures. Heat was applied at the bottom of the barn and distributed throughout the barn by upward convection currents. In the early days wood fires were the heat source. These systems were very inefficient as there was no recirculation of air and heat loss through the top of the barn was considerable. Bulk curing barns have replaced the original barns. These barns are air-tight and heated air is recirculated under pressure through and around the leaf. A much greater quantity of leaf can be cured in this way and temperature and humidity control is more accurate. Modern curing units normally use briquettes or diesel as a fuel source. On average, a kiln in Victoria is required to cure about 7 loads of tobacco per year. The curing process can take from five to eight days to complete and can be divided into three basic stages. During the initial stage (Colouring), the kiln temperature is raised from 32C to 40C while the leaf yellows. This change in colour from green to yellow, is accompanied by a number of chemical changes. The colouring stage of the cure can take from 40 to 80 hours depending upon the plant position and the degree of leaf ripeness. In the second stage of the cure, (Lamina drying), the leaf blade is killed by drying it out. During this stage the kiln temperature is gradually increased to approximately 50C over a period of 12-24 hours while humidity is reduced. This temperature is held until the leaf blade is dry. The final (Stem drying) stage commences when the leaf blade is dry. The objective is to remove all moisture from the stem and to ensure temperatures reached are high enough to prevent any further chemical reactions. Stem drying should be completed at approximately 70C during which humidity remains low. After the leaf is completely dry, it is too brittle to handle. Moisture is added to the leaf so that it can be easily handled. This is done by increasing the humidity in the kiln while the fan is running. This is known as Conditioning. Conditioning can take up to 12 hours. The major problems which occur during curing are leaf browning, over colouring, sponge, runback and scorching. Leaf browning is caused by having humidity levels too high when the temperature is increased at the end of colouring. This causes the leaf to continue to respire until all the sugars are used up, causing a reduction in weight and leaf browning. Sponge is a term used to describe a leaf which has been too wet when the temperature has been increased at the end of colouring. Spongy leaf is typically yellow brown, thick and poor quality. Runback is caused by moisture from the stem seeping back in the leaf blade once it has been dried. Runback occurs when the kiln is allowed to cool down during the lamina or stem drying stage. Scorching is caused by an increase in temperature during the final drying stage above 70C. Scorching causes the leaf to become 'cherry red' in colour. The Tobacco Co-Operative of Victoria Ltd. Please note: This publication is intended as general information only. The growing of tobacco in Australia is now regulated by the Australian Taxation Office (ATO). Permission for commercial or private cultivation or manufacture of tobacco should be sourced from Bob Harkins, Compliance Team Manager, (02) 9374 8501. The advice provided is intended as a source of information only. The TCV and its officers do not guarantee that the advice is without flaw of any kind or is wholly appropriate for your particular purposes and therefore disclaims all liability for any error, loss or other consequence, which may arise from you relying on this advice.